The 5 Star Makeover group is convening once more and the topic is Greek Meze. Since my game is history and food, I went to ancient Greece by way of a favorite cookbook, The Classical Cookbook by Andrew Dalby and Sally Grainger to find my contribution to the makeover. With so much to choose from, deciding on what to pick is not easy. 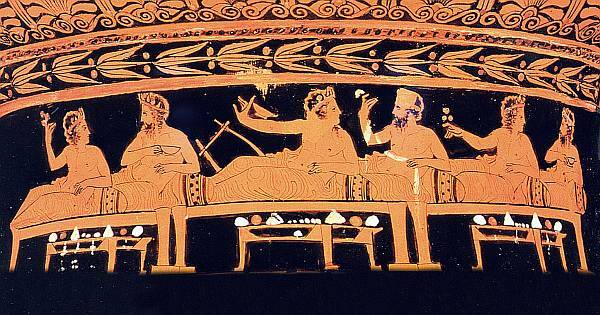 Mediterranean cuisine began in Greece after all, but so did Western Civilization ––hard to believe but there is more to Greek culture than just the food. For example, when I think Greece I think pottery. 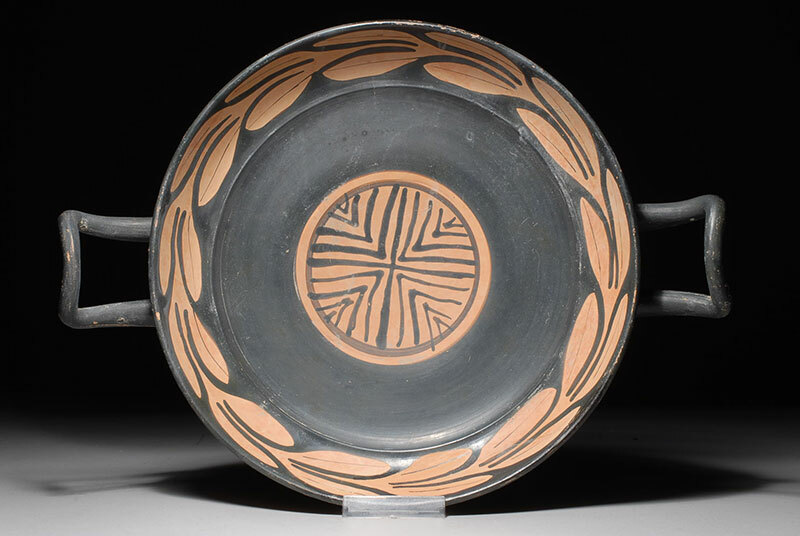 I have had a serious crush on Greek pottery for as long as I can remember (that and the Klismos, but that's another story). 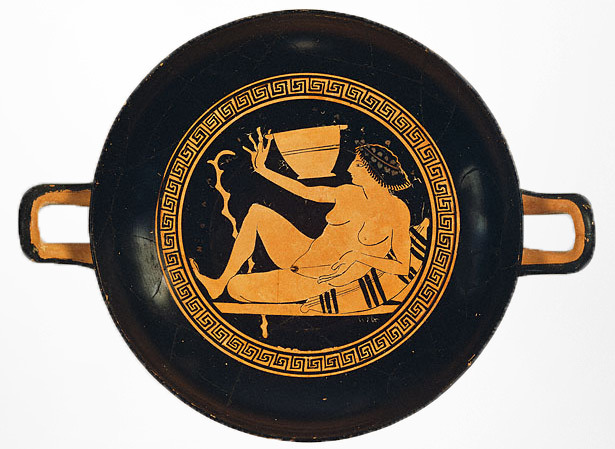 There is something strangely compelling about their red and black pottery, often populated by comely men and women up to their Attic antics –– eating, drinking and frolicking. 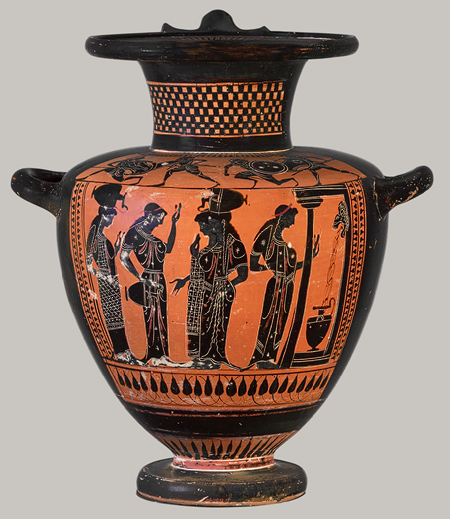 Mr Keats was certainly captivated by their frozen beauty in his Ode to a Grecian Urn. 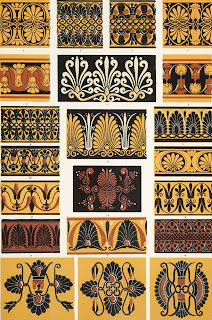 Greek pottery decorations of this period did seem to capture life of the times more often than not, sort of proto-life-style reporting and their revelries were embellished with magnificent Greek key and palmette patterns meandering elegantly around the clay surfaces (more heroic subjects seemed to end up in marble). One of my favorite jobs as a production designer was working on a PBS program that went from Archimedes' ancient Greece to Thomas Edison's 19th c New Jersey. For the Greek section I got to make great furniture and pottery and it was an incredible thrill. 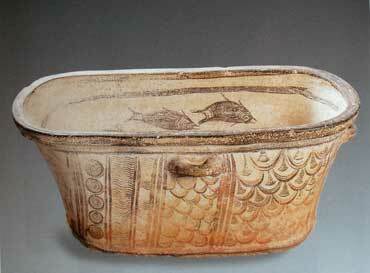 Since the “Eureka” moment happened in a bathtub, we got a metal horse trough and a great fabricator made it into a credible “terracotta” tub that looked like the real deal (it was based on the tub above) complete with carousing porpoises that my art director and I painted (as well as the oil lamps, a giant ewer for pouring bath water –– all made by a wonderful potter in Tribeca) and a gorgeous 3 legged wooden table (all of which went to the lucky director, drat). Originally, the pottery was made using a "black figure" technique that involved a black slip background from which the red color patterns were incised after a first firing (this is a little like the scratchboard technique I remember from art class as a kid). Then the clay was fired again to lock the design. 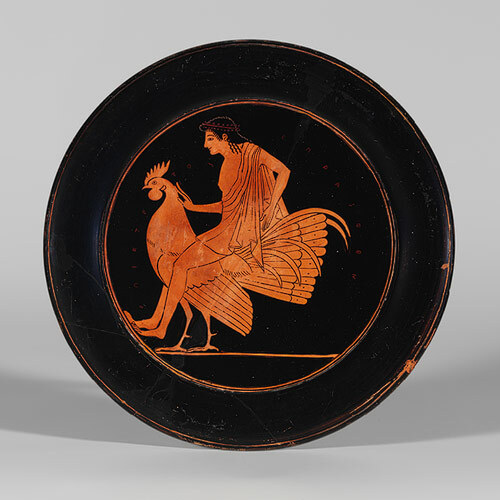 Around 530BCE, this evolved into the "red figure" technique that allowed the potters to paint the design on the pot instead of scratching the design into the black surface. 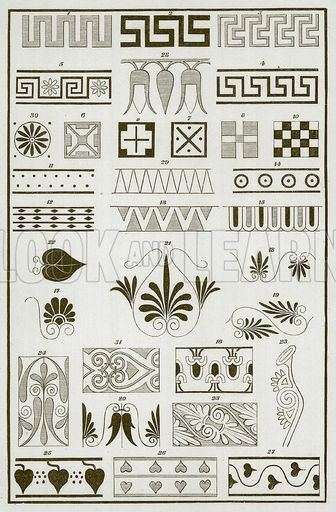 That gave the craftsmen the ability to create more intricate designs. Interestingly enough, much of what we know about Greek lifestyle come from the designs on these magnificent pots –– the aforementioned proto-life-style reporting,–– fleshed out by great contemporary accounts that have been saved through all these thousands of years. We can see the way they ate, what they sat on, ate from and what they were wearing (or in the case of the servants, NOT wearing). 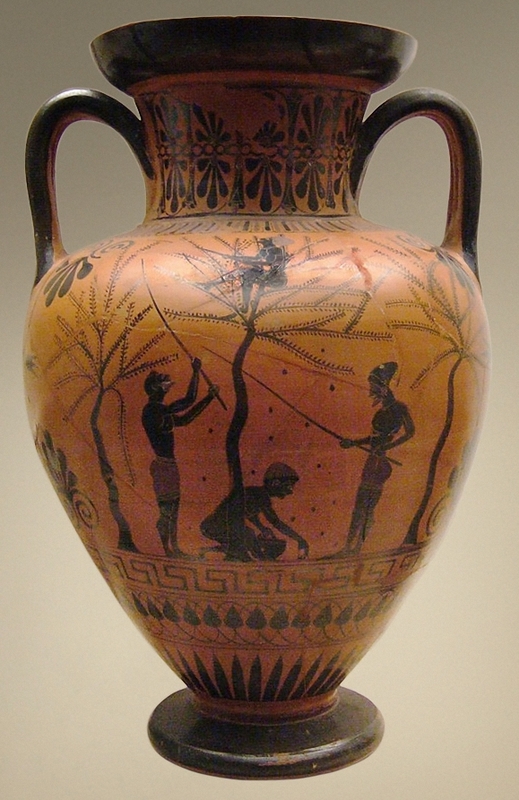 Kottabos-playing Greeks were a frequent subject for pottery designs. Kottabos was a game that involved accurately tossing the dregs of your wine cup (usually a low kylix form as seen above) at a target (really hard to wrap your head around Socrates playing this undignified game but it was a sure fire way to lighten up a party). “ The most usual form of the game was this, –a piece of wood like the upright of a balance having been fixed in the floor or upon a stable basis, a small cross-beam was placed on the top of it [a wooded base] with a shallow vessel like the basin of a pair of scales, at either end. 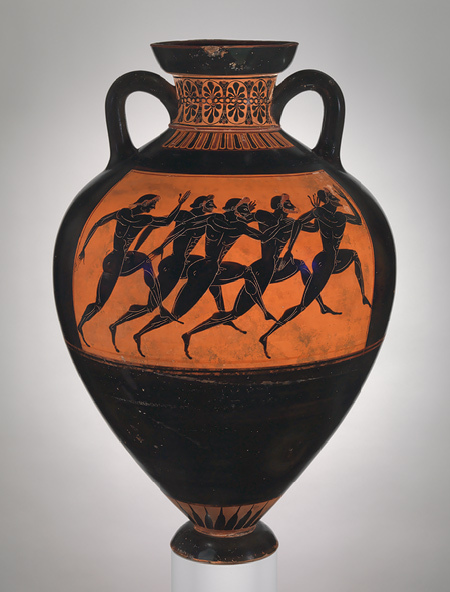 Under each of these vessels stood a broad-mouthed vase, filled with water, with a gilt bronze statue called a Manes, fixed upright in its centre.” When done properly, one thing would hit another making a sound “by an onomatopoæ called latax” (the act of tossing was called ankula after the turn of the wrist involved in the toss). The victor was the one who spilled the least wine and made the most noise. It was also thought that the greater the success at the toss, the higher the “place occupied by the player in his mistresses affection”. Kottabos shenanigans aside, I can just imagine the simple Greek room, with diners leaning on silk-cushioned couches set about the spare elegant space, discoursing brilliantly whilst eating from gorgeous low tables laden with lovely, clean-flavored food that is as good today as it was 2500 years ago. The Classical Cookbook said the recipe for the sweet and sour glazed shrimp I made was suggested by a few words in a remarkable document called The Banquet of Philoxenus from around 400 BC, "Honey-glazed shrimps besides, my love" is all there was to work with. Grainger, with her encyclopedic knowledge of the cuisine of the period, put together the recipe using appropriate ingredients and techniques from those few words –– a well-educated guess. 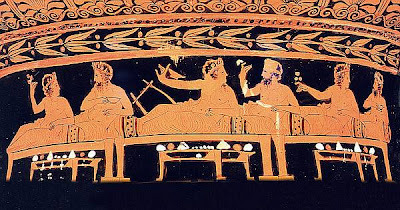 Grainger described The Banquet of Philoxenus as “a poetic celebration of obsessive culinary pleasures, a literary dinner-party” (available online HERE and a lot of fun to read). It is full of lush descriptions of topics discussed and food eaten but also does things like calculating the size of the party by the number of couches in the room. What a world it was. Bearing the crusts and spoons away in the flood. Descended to the gullets of the dead. The smoking streamlet in the stead of oysters. With sauce of every kind, and cook, and country. A dainty dish, on fried meat balls upraised. What will you say then when you hear the rest? Above our heads, hanging in air as it seem'd. Of fragrant wine for all who wish'd to drink. Straight reappear'd in twofold quantity." Not bad, right? Contrary to what you might infer after reading the above, the Greeks ate lots of fruits and vegetables at these wine soaked, flower scented bashes. I thought for my offering I would include a vegetable recipe from a different source, “Cabbage in the Athenian Way” that came from Mnesitheus, a Greek medical writer from the 4th c BC who said that this mixture cured headaches (also in The Classical Cookbook). It is a delicious refreshing salad and the honey vinegar (known as Oxymeli) is divine –– the cabbage is a great companion to the shrimp. The dishes are beautifully conceived; sweet and sour with a great deal of interesting but subtle flavors from the herbs and that dusky asafetida. You will be shocked at how modern it tastes. Cook the shrimp in the oil with the fish sauce and honey. Remove the shrimp and reduce the sauce by 1/2. Add the oregano and pepper and pour over the shrimp. 2 T red wine vinegar. vinegar, salt and asafetida powder. *Rue can be purchases at some well-stocked herb plant stores or you can buy it online HERE. Although it is available dried at some spice stores, I do recommend using fresh. If you can't get it best to skip it... nothing else quite like it.. 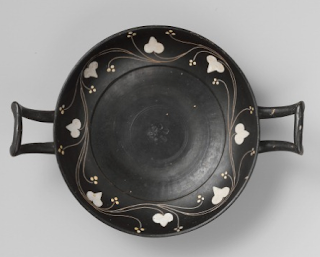 This is a really great post and I love the Greek pottery as well. Very educational. As per usual, an extensive and flawless presented post. Love the cabbage and the shrimp compliment it perfectly. Well, your posts always make me look at or think about something in a totally different way, and so it is now with cabbage! It now seems downright romantic to me. Great contribution, as always. I love your posts! This was a great one. I have never seen shrimp prepared using fish sauce...something to try. The color of the shrimp is so gorgeous! I would love to try this preparation of cabbage! You have such an interesting job, Deanna, and I love visiting you here - each post is at once lyrical, educational, and evocative of the time period. 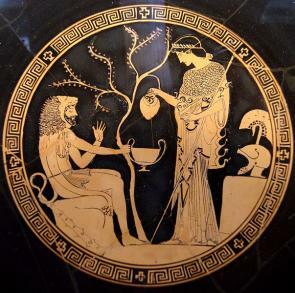 Pottery is an art form that has interested me since college days, it reveals so much about a society, and now I'm intrigued by this Athenian cabbage with asafetida and rue! To think of how Greek culture quietly pulsates within our daily living is staggering. From language to governmental systems to education, this ancient view of life contributes such life to show me that life is a CYCLE and RECYCLING of ideas.....they are just MADE OVER. This simple but elegant recipe is something almost any American family could make, but did we even know the origins?! FABULOUS MY DEAR and thank you for our lovely comment on my post. Yes, unfortunately, our daily encounters with the people we live with and love with have reread us like a book, but absence does make the heart grow fonder of reading your favorite chapters. Oh the joys of summer vacations and friendships! I am so enamored with ancient Greece, this post really had me captivated. Really lovely. I never knew that about the "red figure" technique -- very interesting! Love the dish you made...sounds like it has the perfect balance of flavors! What an interesting project that must have been. Too bad that the director got all of the replicas, though! Wouldn't that have been wonderful to walk away with even one item. Beautiful shrimp and cabbage dishes and so beautifully presented as always. Wow, that basin is lovely. (You don't even have a photo of YOUR tub?) Fascinating enterprise, Deana. You are so talented. I loved your explanation of red and black figure techniques. 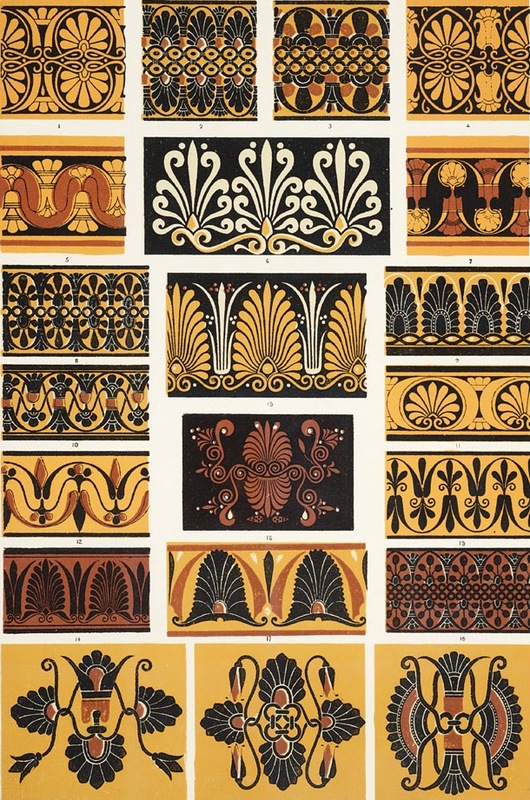 And share your enthusiasm for Greek Design. Getting around to food: inserting mead in lettuce? Hmmm. Might be interesting as I think mead is rather sweet, isn't it? Your shrimp is a simple recipe with great flavor and perfect in combination with the cabbage. As always, a very informative and interesting post. The shrimp and cabbage look delicious! Your shrimp look delicious and how fun to get a bit of Greek history along the way. Nice post. Beautiful honey glazed shrimp and love the unique salad. This takes me down memory lane back to college where I took a Greek art history class. Great to read. I have rue in my garden...I am going to have to try out this cabbage dish for sure :) It all looks wonderful though and I just love your presentation! And as always I love the history, such a great read. I especially enjoyed the pottery background, I really love Greek pottery as well...so beautiful! You got a lot of Greek history here. I barely know about the Greek history even when I made the Greek dish. 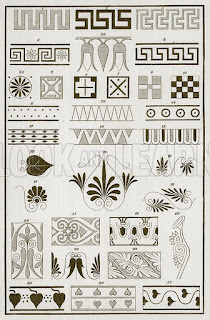 The pottery backgroud you posted here is lovely and has its own charater. Who would have thought fish sauce and honey could go well together! The salad dressing sounds interesting espically with the raw cabbage. Very nice recipe, I particularly like the cabbage salad. Such an interesting post Deana! Shrimp & cabbage sound like a perfect duo. My little guys learned all about those Greek pottery forms in an art history course when they were in 6th grade! Your post has been a fun review for me. And your shrimp looks delectable. I hope poor Petunia can hear me sending cooling thoughts her way. She can come visit me for the summer, and lie on the nice cool porch, catching a breeze! You know I love the giants! Oh what I would do to be a guest at those Greek banquets! It sounds like a lush party for the most serious of foodies. I'll have to look up how to find rue, I'm intrigued! I remember those jars from a history project!